Yacht management software is continuing to drive advancements in the global superyacht industry. Management and crew are enjoying the benefits of having a highly organised, process improving tool at their finger tips on an increasing number of yachts navigating the globe today. Purpose: Understanding the purpose of why you require software in the first place is essential. Yacht management software can be broken down into three categories. Planned Maintenance System – This software usually contains modules specifically for the engineering department, but can also be used effectively on deck. These systems will always have more comprehensive features for the engineering department compared with a total yacht solution. Administrative Solution – This software can include anything from an accounting solution to an ISM solution, or Hours of Rest solution. Features: So what features do you need? This depends on the purpose of your solution. Every software is different, some with features such as a barcode scanner, some with accounting modules, and some as simple as a planned maintenance system. Choose software with features that you will use, don’t pay for ones that aren’t suited for your vessel. Usability: The usability of the software is the most critical aspect when choosing the right solution. Today’s crew come in all ages and backgrounds all resulting in varying technical competencies. A user-friendly interface and a logical workflow should be prioritised. Simplicity is key! Crew turn over is an inevitable process. For managers, captains and department heads, having an onboard solution that can be easily understood and mastered is going to reduce the time needed in retraining. Look for repeatable formats and data entry processes. Find a user interface that is simple to navigate and is not cluttered. Support: A multi layered technical support network is going to provide the best coverage for you support requests. The providers who value their support offering will provide more than just the typical email support. How a software company supports you once your up and running is a direct reflection on the how the company appreciates your business. Look for a company that has 24/7 support and responds to emails and phone calls in a responsive manner. With live chat and video sharing technology now mainstream, look for more intuitive means of support. Training is also a big factor in choosing the right software. Some companies will charge enormously for training, so be sure you read the fine print. Cost: Every vessel has a budget, some greater than others. Getting ‘value for money’ can be easily achieved if you do your homework. When considering the cost savings of improving your component reliability and reducing unplanned downtime, you will soon understand an investment in a yacht management software is a good financial decision. Regardless of what your requirement is, what is important is the process you take to finding the right platform for you. 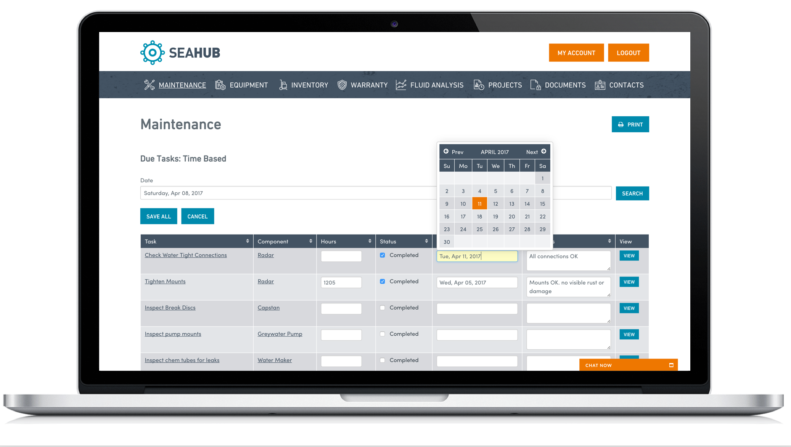 At Seahub, we have set out to develop the most comprehensive planned maintenance system on the market with a modern user-friendly experience. Contact us today to view our prepopulated demo and see how Seahub can work for you.